In Pokémon Emerald, Rayquaza appears to use Hyper Voice to calm down Groudon and Kyogre at Sootopolis. Rayquaza couldn't learn it in any Generation III game, but this was rectified in HeartGold and SoulSilver versions. Rayquaza has the highest Attack and Special Attack of all Flying-type Pokémon. 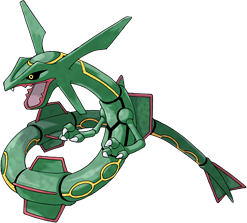 Rayquaza has the highest Attack of all Dragon-type Pokémon, tied with Zekrom, and the highest Special Attack of all Dragon-type Pokémon, tied with Palkia, Dialga and Reshiram. Rayquaza is the tallest legendary Pokémon. Out of the weather trio, it is the only one with a secondary type.